I play a lot of different viewer submitted decks on stream, which gives me a broad perspective on different things in the format. After playing all these different things, something I get asked fairly often is what my favorite deck is in the format. Today I would like to break down my current favorite archetype in the format: Blue-Green-X Climb. The “explore package” of Wildgrowth Walker, Merfolk Branchwalker, and Jadelight Ranger give us a lot of play against aggressive decks. Not only do these creature let us block in combat, but they also help us hit land drops consistently ensuring we do not stumble very often. Wildgrowth Walker can single handedly run away with many games against aggro if left unchecked. Hydroid Krasis and Growth-Chamber Guardian provide outlets of card advantage in matches where we need to grind a bit. Both of these cards can be meaningful in the early and mid-game, while also serving as a big top deck in the late game when we have a pile of mana to spend. Speaking of having mana, Llanowar Elves is quietly the best Green creature in this Standard format. Getting ahead on the play or catching up on the draw, there is basically no better turn one play in this format than Llanowar Elves. Incubation // Incongruity is a card I have been continually impressed with. A removal spell that still functions against control decks or creatureless opponents is incredibly strong. Against aggressive opponents, Incubation helps us find Wildgrowth Walker more consistently. Against control, it lets us dig deep to find Hydroid Krasis sooner. Against opposing midrange decks, Incongruity deals with their largest threat in a fairly clean manner. 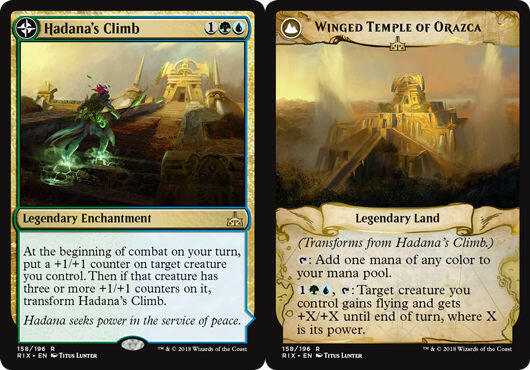 Hadana's Climb is a fantastic tool for breaking board stalls in this format. To start, it makes our creatures just a bit larger so they can likely attack in on the ground. Then, once it flips, it allows our creatures to soar into the air for large chunks of damage at the time. Climb also synergizes will with Growth-Chamber Guardian since Guardian does not care how it gained a counter to search up a friend. You’ll note that the above only lists 31 spells. In my experience we want 24 lands, which leaves room for five additional spells. While I am very confident in the core cards I listed above, I am still trying to find the right mix of supplemental spells for the remaining slots. The biggest upside to staying in just two colors is that the mana is less painful. Playing lots of basic lands means we get untapped lands most turns without paying life and we will almost never be left holding spells we do not have the colors to cast. However, the biggest drawback to staying in two colors is that the spot removal we have access to leaves a bit to be desired. After Incongruity, the next best Green based removal spell is Thrash // Threat which requires a creature and can be blown out. Ravager Wurm is a card that I have been consistently impressed with in every deck I slot it into. It provides an aggressive threat for closing out games, while also acting as additional removal that we can search up with Incubation. I still like playing a couple copies of Thrash // Threat even with Red mana, because we gain access to the Threat half of the card as well now - making it more flexible. Lava Coil out of the sideboard is a big gain for splashing Red though. This is easily one of the premium removal spells of this Standard format. Not only because it exiles the target, but also because four damage for 2 mana is a good rate that allows it to trade up on mana with many threats. The Black splash probably enables the most directly powerful cards. Hostage Taker and Find // Finality offer a good deal of utility in the main deck, while access to efficient removal like Cast Down and Assassin's Trophy deal with many opposing threats out of the sideboard. We also open up the ability to play discard like Duress to attack control and combo decks on a different axis. The White splash is probably the weakest in my opinion. Militia Bugler is reasonable card advantage, but makes sideboarding awkward if we don’t want to miss on its trigger too often. Baffling End is better removal than something like Thrash, but just barely. Exploring this archetype more and more just gives me more evidence to how much depth this Standard format has. In addition to there being so many different unique archetypes out to explore, almost every one of the specific archetypes leave a variety of decisions to be made about how exactly you want to tune the details. If you have a good understanding of what exactly you want to beat heading into a given weekend, you will likely be rewarded for it. Have you tried any Climb decks in Standard so far? Did you try a splash a color or do you think things are fine enough with just two colors? Let me know in a comment below!